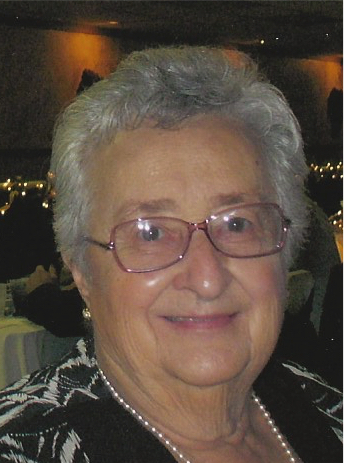 Obituary for Agnes M. Ezzo | Todd Funeral Home, Inc.
Agnes M. Ezzo, 90 of Brighton Township passed away Saturday, April 13, 2019, surrounded by her loving family. Born February 28, 1929 in Midland, she was the daughter of the late Stephen and Rose Kasunich. Agnes lived in Brighton Township for the past 66 years. A graduate of Midland High School, Agnes worked for Crucible Steel in Midland and later worked and retired from Joseph Horne Co. Agnes was a long-time member of SS. Peter & Paul Catholic Church in Beaver. She was an avid line dancer with Silver Sneakers, enjoyed starting her flowers from seed for her garden, loved reading, playing scrabble, and enjoyed baking for her family. In addition to her parents, she was preceded in death by her husband Michael A. Ezzo on February 10, 2018, a brother Stephen "Junior" Kasunich, sisters Kay Maljevec, Helen Maljevec and an infant sister, Frances Kasunich. Surviving her are her children, Michael Ezzo, Moon Township, Karen Shultz, Bedford, Texas, and Linda (Dennis) Knott, Beaver; cherished grandchildren, Teri (Daniel) Laczo, Newark, Delaware and Michael Shultz, Bedford,Texas; brother, John (Dorothy) Kasunich, Midland; sisters-in-law, Jennie Straile, Rochester and Patricia Ezzo, Beaver, and many nieces and nephews whom she deeply treasured. Friends will be received Tuesday from 2 to 5 and 7 to 9 in the Todd Funeral Home, 340 Third Street, Beaver. A Mass of Christian Burial at SS. Peter & Paul Church in Beaver will be celebrated Wednesday at 10:30 AM by Father Robert Miller. Interment will follow in Beaver Cemetery.